If your business is moving to the Maricopa County area, you’ll need to furnish new office space and establish everything your business needs to operate smoothly. Consider a color purchasing, renting or leasing a copier from Arizona Copiers. Our service area covers the cities of Mesa, Phoenix, Tempe, Scottsdale and Chandler, and surrounding areas. For a reliable copier company in Maricopa County, contact Arizona Copiers. If your company is looking for a reliable copier company in Mesa, consider Arizona Copiers. 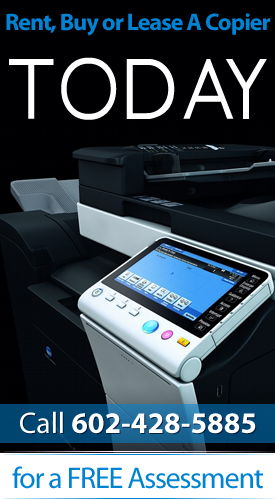 We provide quality, tested copy machines in the Phoenix Valley. With our copy machines, you will experience years of reliable service. We also provide comprehensive business solutions for sales and repair services for office fax machines, copiers, laser printers and multi-function devices. Consult with us today about your specific copier needs. Phoenix Copiers helps keep your organization’s staff working at their maximum capacity and productivity. With a single machine, you can now store, index, organize, scan search, capture and retrieve any document rapidly. Consult with our product specialists to determine the most useful copy solution for your hardware and software needs. If you are looking for a copier company in Scottsdale, look no further than Arizona Copiers. Scottsdale Copiers helps keep your organization’s staff working at their maximum capacity and productivity. With a few touch-screen commands, you have the power of scanning, saving, storing and retrieving documents quickly. It can be overwhelming to select a new copy machine. Let our experienced product specialists help you find the best copy machine for your business needs. Tempe Copiers allows your small business or one-person home based business to reproduce professional, glossy brochures, agendas, conference proceedings, sales materials and technical documents, and training coursework. Our copiers also make it easy to electronically archive, share and retrieve documents. The newest copier features can improve communication between different office locations or allow you to send files to clients and customers directly from a machine.